«In our family, » Toulouse-Lautrec quipped, «once baptised, one is in the saddle.» Lautrec's father was a fanatical-and somewhat idiosyncratic-horseman, falconer, huntsman and racegoer, who intended his only child to follow his example. But the young boy's riding ambitions were shattered by the breaking of both legs and the resulting stunting of their growth. Nonetheless, Lautrec's intense curiosity for all things equestrian was maintained when, from 1878 to 1882, he became the pupil of the well-known sporting artist, René Princeteau (1844-1914), a close friend of his father's. His own early work -precociously between the ages of fourteen and eighteen- is dominated by horse subjects. He copied Géricault and more recent Salon artists; essayed racing subjects dear to Princeteau; looked at work of John-Lewis Brown, another specialist of hunting scenes and race-meetings; but he was not in the least inspired by the equestrian subjects of Degas, an artist who would later attract all his admiration. Whether he actually painted known racecourse meetings is unlikely. It seems more probable that he made rapid exploratory sketches on the spot, and subsequently painted the composition in the studio. 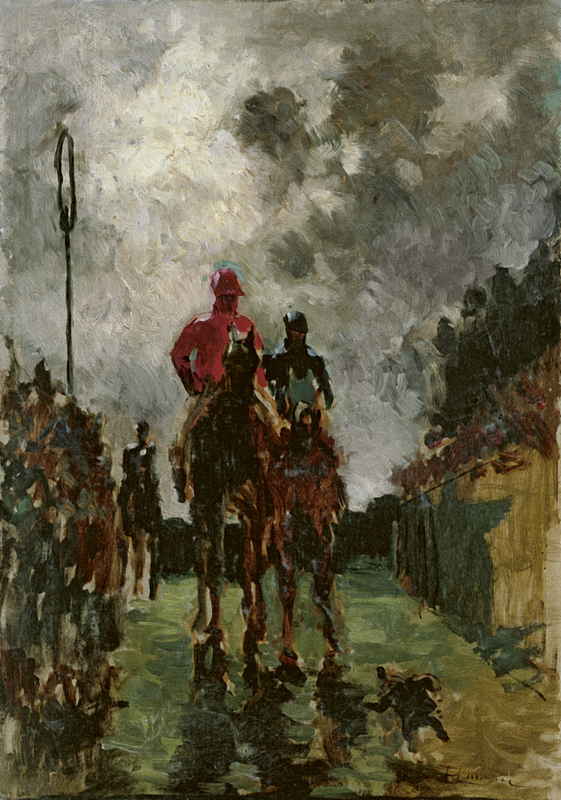 The Jockeys, though undated, is usually ascribed to the year 1882, together with a closely related, but smaller, composition of the same motif. It is freely painted in a skein of short, staccato brushstrokes whose liveliness adds to the animation of the scene. The presence of the running dog suggests a "gentlemanly" country race-meeting, rather than the famous metropolitan tracks at Longchamp or Auteuil. These appear to be "gentleman-jockeys" on their curiously elongated steeds. A highly charged sky of threatening rain clouds produces a striking contre-jour effect: the scene is back-lit, with thrown shadows falling towards us, the spectators (of the picture). After 1882, the incidence of equestrian subjects diminished as Lautrec adopted the more rigorous procedures of a Parisian atelier training and subsequently chose la vie moderne of Montmartre as his essential subject-matter. An occasional circus painting (1888); and the series of drawings of performing circus horses done from memory in the asylum at Neuilly in 1899, as well a small lithographic series projected in the same year but never brought to a satisfactory conclusion, are highlights of Lautrec's later treatment of the horse.